These services include: bathing, dressing, grooming, reminders or assistance with medications, wound care, range of motion exercises, light housekeeping, transportation, companionship, meal preparations and integration into the community for individuals with developmental disabilities. Specialties Registered Nurses work with your physician to ensure that you are receiving "Just what the Doctor ordered!" 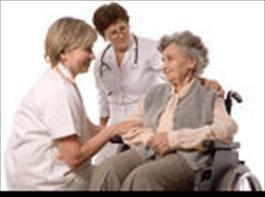 Home Health Aid - Maintain appropriate certification on the State of Wisconsin Registry. Personal Care Workers - follow a specific care plan outlined by a Registered Nurse. RN’s preform supervisory visits every 60 days to assess client needs and oversee PCW performance. Our staff is certified in CPR, Medication Administration, First Aid, Fire Safety, Dietary Training & a variety of other areas. We provide service to the nearby Eau Claire County communities and areas of Augusta, Fall Creek, Fairchild, Altoona and Eau Claire. In Chippewa County we provide services in the communities and surrounding areas of Chippewa Falls, Cadott, Bloomer, Boyd Cornell, Holcombe, Jim Falls, New Auburn and Stanley. Our services are available in Dunn County with areas and surrounding towns that include: Boyceville, Colfax, Downing, Downsville, Elk Mound, Knapp, Menomonie, Ridgeland, Tainter Lake, and Wheeler. Our medical and home care can be provided in Jackson County including: Alma Center, Black River Falls, Hatfield, Hixton, Melrose, Merrillan, Millston, and Taylor. We are licensed in Clark County too including Abbotsford, Chili, Colby, Curtiss, Dorchester, Granton, Greenwood, Humbird, Loyal, Neillsville, Owen, Thorp, Unity and Withee. In Trempealeau our services are in Arcadia, Blair, Dodge, Eleva, Ettrick, Galesville, Independence, Osseo, Pigeon Falls, Strum, Trempealeau and Whitehall Wisconsin and areas nearby. We can also serve you in or near Baldwin, Deer Park, Emerald, Glenwood City, Hammond, Houlton, Hudson, New Richmond, North Hudson, Roberts, Somerset, Star Prairie, Wilson and Woodville, Wisconsin - all in the Wisconsin County of St. Croix.